Deep Silver and Techland have announced Dead Island’s Bloodbath Arena DLC has been delayed. According to a post on the game's official Facebook page: “We are working hard to make the Bloodbath Arena DLC available as soon as possible. However, due to further polishing of the main game the finalisation of the DLC code has been delayed. Earlier this month, the game’s publisher announced that the DLC could possibly see a delay as the dev team continued to focus on fixing gameplay bugs, and various other issues. Bloodbath Arena, the first of two downloadable content packs planned, was originally scheduled for a late-September release. If you're one of the PC fans who's been eager to get your hands on Ubisoft's Assassin's Creed: Revelation, your wait just got a little longer. "Assassin's Creed Revelations will launch on Xbox 360 and PlayStation 3 on November 15 and PC in December." If you’re like us you probably loved Psychonauts. If you’re not like us you probably don’t sleep in an alien cocoon, but hopefully you still like Psychonauts, because Double Fine’s classic platformer is getting a new Mac version, new PC update, and new companion iOS app. Today, Steam users can download the game’s update, which includes achievements, cloud saves, and modifications to the Meat Circus. 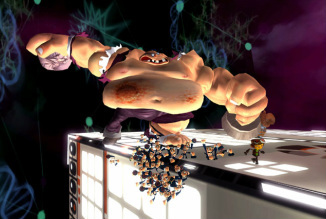 “We are really excited,” said Double Fine president Tim Schafer, “to finally be answering fans’ requests for a more difficult Meat Circus.” Schafer was, of course, joking about Meat Circus, because the updated actually eases the difficultly of that notoriously punishing section. In addition to the Mac version, Double Fine has also released the Psychonauts Vault Viewer! iOS app. With the Psychonauts Vault Viewer! players can look through all the secret thoughts of Psychonauts’ characters while listening to newly recorded commentary from Scott Campbell and Tim Schafer. The game centers on vacationers whose island paradise becomes a living hell when a zombie outbreak quickly spreads. Cut off from the rest of the world, the survivors have only the available materials and the island’s natural “weapons” to protect themselves from the viscous and growing legions of the undead. 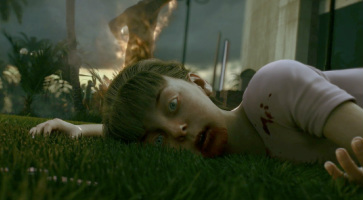 In addition to the award-winning trailer and video game, the Dead Islandintellectual property will be simultaneously developed by Deep Silver into forthcoming graphic novels, novels and other extensions. According to Willits, the large install on PS3 is to cut down on texture loads. “Sony was great. Kudos to Sony for letting us do that. They don’t allow every game to do that. So definitely, hats off,” he said. “What we were able to do is install all the textures to the highest level. What is nice about the PS3 platform is that it’s just one platform. Everyone has one Blu-ray drive, one hard drive, it’s all the same. Some of the other systems you have… should I install it on my 360? Should I not install it? So yes, it’s very nice. “You don’t really need to install the multiplayer disc if you’re really tight on hard disk space,” he said. As far as using the game’s tech for the future, Willitis said id is prepared for it, and since the engine scales up, it will be “easy-peasy,” to implement in next-gen consoles. “We’ll be using parts of this tech for decades,” he said. RAGE is out the first part of October on PC, PS3, and Xbox 360. Gun Runners’ Arsenal releases next week for Fallout: New Vegas, and to get you acquainted with the weapons, Bethesda has updated its blog with more information. Mad Bomber (Perk) - Specialized training is now available for wastelanders with a talent for Repair and a love of Explosives. Learn how to get the most of your Powder Charges, Bottlecap Mines, and Time Bombs! Love Mini-Nukes but hate carrying around a Fat Man? Slap on a Sensor Module and make a Fat Mine! Want to find another use for those heavy Microfusion Cells? With a bit of Scrap Electronics and some know-how, you’ll be hurling MFC Grenades and MFC Clusters in no time! Crafting humble Tin Grenades and even devastating Nuka-Grenades are a snap with this handy perk. Tin Grenade, Fat Mine - Two ends of the Mad Bomber spectrum, similar purposes: blowing things up. A Tin Grenade is one of the simplest recipes we’ve seen. Take some ordinary Pistol Powder, a Tin Can, and some Duct Tape. Wrap them up (you put the Pistol Powder into the can, we’re told) and you’ve got a cheap, low-power grenade. How does it detonate? Don’t ask us. If you like the explosions generated by Mini-Nukes (who doesn’t? we don’t want to know them) but don’t like carrying around a Fat Man, you can use some Scrap Metal, Scrap Electronics, and Sensor Module to turn that Mini-Nuke into a Fat Mine. Same explosion, different detonation technique. Warning: be careful about planting these on folks — for reasons we hope are obvious. Nuka-Grenade - This East Coast special has finally reached the shores of Lake Mead via some impressive and inventive Mad Bombers. Just take some Nuka-Cola Quartz, a Tin Can, some Abraxo, and a bit of Turpentine, and you’ve got a grenade that puts “ordinary” plasma to shame. We’re starting to wonder how people kept this stuff in their homes without leveling entire city blocks, but that’s science for you. Optimized Small Energy Cell, Micro Fusion Cell, Electron Charge Pack, and Flamer Fuel -Though we specialize in guns, we’re more than aware of the common complaints about energy weapons: ”My Laser Pistol doesn’t pack enough of a punch!” “The ammo’s too heavy!” “Max Charge ammo eats through my Tesla Cannon like a Glowing Ghoul at a Radroach buffet.” The Gun Runners don’t have the cure, but if you’ve got the talent, scientist, heal thyself. Optimized Energy Weapon ammo: 30% more damage, superior armor penetration, and they even weigh less. The only drawback is a slight increase in weapon degradation. Requires Vigilant Recycler. GRA Laser Pistol, Plasma Pistol - Never let it be said that the Gun Runners are snobs. We’ve worked on some distribution deals for customizable low-end Energy Weapons. Don’t let the “low-end” designation fool you. With new mods, these weapons can be potent against a surprisingly wide range of foes. The Laser Pistol’s Combat Sights make the weapon much more user friendly. The Focus Optics customization boosts damage. On the other end of the (visible) spectrum (heh), the Plasma Pistol’s High-Energy Ionizer elevates its already impressive damage into the steel-melting range. A Magnetic Accelerator addresses the traditionally slow projectile speed. Recycler mods, to lower operating costs, are available for both weapons. Cleansing Flame, MF Hyperbreeder Alpha - Two more one-of-a-kind (until we hear otherwise) Energy Weapons for clients who are interested in those things. Cleansing Flame is a high capacity Flamer with superior base damage, longer range, and a burn effect that improves with the user’s skill. An Energy Weapons expert is absolutely devastating with this monster! The MF Hyperbreeder Alpha is a unique Recharger Pistol that’s been hotwired for automatic fire. A previous owner heavily modified the internal breeder reactor for a rapid recharge rate, making this quite handy for anyone who doesn’t like to carry around a lot of ammo. Sprtel-Wood 9700, The Smitty Special - If you forced the Gun Runners to use an Energy Weapon, we’d pick an automatic every time. We’ve got a line on two ultra-high-end unique models for our more well-to-do clients. The Sprtel-Wood 9700 (above) is a devastating high-speed Gatling Laser. It has a small ammo capacity, but its incredible accuracy and elevated damage mean that armor isn’t much of a defense. Load it with Optimized Electron Charge Packs to generate an unstoppable stream of laser power! The Smitty Special is named in honor of a legendary Boneyard weapon builder who produced beautiful plasma weapons with a high rate of fire. This Plasma Caster features an array of dizzying modifications that produce an almost constant stream of plasma bolts. ”Waaah, waaah, but it does so much less damage than a regular Plasma Caster!” Go back and read that again: it’s an automatic Plasma Caster. Even with the reduced damage, it will punch through almost any armor it comes up against. If Mario's recent outings have proved too much for your platforming skills, Nintendo's got you covered. New images of the game's packaging reveal two helpful features to curb frustration. Andriasang has box pictures of the Japanese version of 3DS Super Mario Land, which reveals that the game will support SpotPass for trading items with other players. Assist Blocks will also be included in the game, doling out special items for players who get stuck. This feature was also available in New Super Mario Bros. Wii, so it shouldn't be that surprising that it's included in the upcoming 3DS title, but a little extra help is also appreciated. It seems that Sony has been going "bundle wild", as quite a few triple-A titles are getting their own special box. Now, it's Uncharted 3's turn. 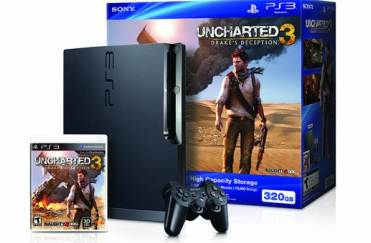 Priced at $299 (the price for the system alone), you will get the highly anticipated Naughty Dog game, Uncharted 3, along with a 320GB PS3 system and a month free of Playstation's premium content service, Playstation Plus. This bundle will be released on November 1st, same day as the game. Will- To me, I feel like this announcement shows that the PS3 is coming to the end of its lifetime. Go back to the golden age when the N64 was the console to have. When the system was nearing it's retirement, Nintendo went crazy with releasing "special edition" systems and bundles. As we all know, history sometimes repeats itself, and I feel this is a prime example unraveling right in front of us. How much longer does the PS3 have? I would say E3 2014 we'll be looking at an announcement. Does anyone feel the same as I do? Leave a comment and let us know! In a world of decreased exclusives, it's cool to see that the console makers are still trying to grab what they can. 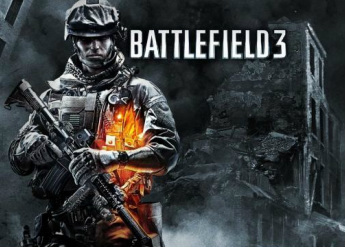 Sony and EA have announced that all "full-blown" expansion packs for Battlefield 3 will first appear on the PS3 for a week before they hit Xbox Live. Over at the Official PlayStation Blog, Tommy Rydling, junior product manager at Battlefield 3 developer DICE, says that starting with the first post-release DLC pack called Back to Karkand (out sometime this year) all "full-blown" expansion packs to the game will have a week of exclusivity on PSN. Interestingly, this move is the mirror opposite of what the Call of Duty series has done recently with the Black Ops DLC, where it has been available first on XBLA and then PSN (albeit for a full month before). If you were wondering what Neversoft -- once Activision's premier internal development studio in the days before Blizzard and Infinity Ward -- has been up to since Guitar Hero was put on ice, it looks like we might have some new clues. A story published on the website Gamerzines speculates that Neversoft is currently working on a first-person shooter -- based on some job listings on the official Neversoft jobs site. The most interesting was for a "Windows PC Platform Lead Engineer: FPS." If the job title didn't make it clear, the desired qualifications did, listing "a strong passion for and experience with First Person Shooters" and "Online infrastructure experience including Steam distribution and security and anti-cheat systems." Comment on any topic. Suggest News.